Less than a fortnight after landing his first stallion Premiership, Snitzel has put up his first city treble of the new season, including Menari, a dashing winner of the $150,000 The Rosebud 1100m LR at Rosehill. 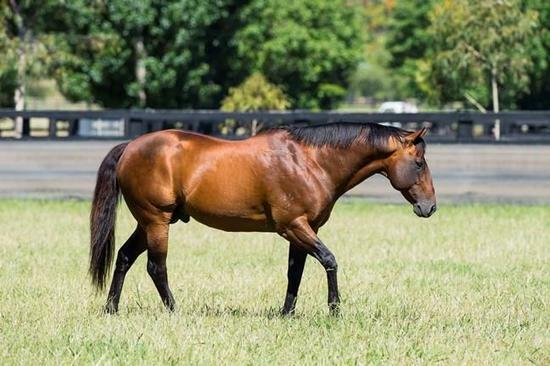 He is the second son of Snitzel to win The Rosebud, following Thronum's success last year, and the 65th stakeswinner on Snitzel's lifetime record. Menari, carrying equal topweight of 60.5 kg, jumped marginally best of the field but as Siege Of Quebec and Perast moved forward on his inside, Josh Parr eased him back towards the rear. Taken wide round the home turn, he balanced up quickly, took control of the race at the 200-metre mark and won by 1.3 lengths from Siege Of Quebec with Trekking a further length away in third. Watch Menari win the ATC The Rosebud LR. Trainer Gerald Ryan, recording his 13th stakeswinner by former stable star Snitzel, can justly feel that his assessment of Menari as an unlucky 2YO has been vindicated. The $1 million Golden Rose G1 on 23 September is the obvious target for him, but Ryan believes he's also a genuine prospect for The Everest. Whichever way Menari goes, the San Domenico S. G3, also over 1100 metres on 26 August is his likely next start. Josh Parr said, "He's an exceptionally talented horse. I know it sounds a little bit arrogant but I was so confident his ability could overcome the bias of the track today. "He's as good as anything I've sat on. I won't say any more." Menari is the fifth foal and second winner out of 2YO stakeswinner Isurava (by General Nediym), a sister to Group 2 winner Ichihara, from the immediate family of Group 1 winner Whisked and her champion son Tie The Knot. Corumbene Stud has also retained Menari's year-younger full sister Sweet Ava, and Isurava is foaling this Spring to Not A Single Doubt. Menari supplied the final leg of Snitzel's Rosehill treble, following the Waterhouse & Bott-trained Arbeitsam's defiantwin over 1800 metres, and The Pharoah's success over 1350 metres for owner-breeder Ottavio Galletta and Gerald Ryan. Watch Arbeitsam's win at Rosehill. Watch The Pharoah's win at Rosehill. With 11 winners in the first 12 days of August, Snitzel is wasting no time putting his stamp on the 2017/18 Australian season.